I was taken to see my first football match when I was about 3 or 4 years of age, and I've been captivated by the game ever since. Although, I fell out of love with the higher echelons in the professional game many years ago. This was at the time when the Premier League was formed; TV money poured in, and only a handful of league clubs seemed to benefit from the 'windfall'. The first professional club that I supported was Wrexham Football Club, who played just six miles from my home. They were the only professional league club in North Wales. For a number of years in the 1960's, I was to be found on the terraces every Saturday afternoon (remember the days when all games started at 3.00pm on a Saturday?) whatever the weather. The Racecourse ground was my football home, and I was pleased to play there once in a cup final - we lost - just. Wrexham have certainly had a chequered history since they were formed in 1872, and like many clubs from lower divisions, it has had majestic highs, and unbelievable lows. I was there when they recorded their highest victory (still the highest today), 10 - 1 against Hartlepool in March 1962. This was also the first time that three hat tricks had been scored in a single football league game. While we're on records, the Racecourse ground is the world's oldest international stadium still in use. In 1984 they beat FC Porto in European competition, winning 1 - 0 at home, and winning the tie on away goals, after coming from 3 - 0 down in Porto. There have been many magic moments. What has also dogged them for years is financial insecurity. Their plight has been no different to that of the majority of clubs in the lower two divisions of the football league. Wrexham were relegated to the Blue Square Conference League at the end of the 2007 - 2008 season, after 87 years of consecutive membership of the football league. After flirting with disaster for so long, the inevitable happened. The problem was spending more money than they took in (sounds familiar?). Wrexham have decided on a way forward, which I'll come to in a moment. 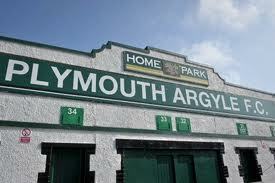 Plymouth Argyle Football Club are just one of a growing number of clubs in financial difficulties. In Administration, as a result of living beyond their means (football calls it 'Living the Dream'), they failed to pay taxes, failed to pay wages and failed to pay bills. Their liabilities exceeded their assets, and they were insolvent. Or they should have been in the real world. But football doesn't exist in the real world, it is somehow different to other businesses, and there are always reasons why clubs shouldn't be wound up. Debts increase, but it still keeps on trading. However, it looks as if a new owner has been found, who will clear the debts (there's around £3.5 million of historic wage debts to clear on its own), and start afresh. But if the business model doesn't change, how long before the merry-go-round of uncertainty begins again? I'm not saying anything that hasn't been said before, and by more experienced people than myself, but how many people are listening. Clubs continue to exist, when in reality they should fold, because of the unswerving loyalty of supporters, players, some managers and back-room staff. At the moment, Plymouth are bottom of League Two, and last month they sacked their manager, Peter Reid "to preserve their league status". This was a man who sold his cup final medal to pay the club's heating bill, and to help particularly younger players who were not being paid. His reward was the sack. Players and back-room staff have continued to do their jobs, when they were not sure of being paid on time. Some owners don't deserve to have such unswerving loyalty, but surely there is another way of running a club? Wrexham have just agreed to go down another route, and to follow in the path of pioneers before them. The Wrexham Supporters Trust will now run the club, and they are asking people to contribute to a community share scheme, with the minimum you can give is £250, and the maximum, £20,000. This is the beginning of a longer process, and everyone who gives will have a say in how the money is spent. This means that supporters are in charge of the club, which ought to mean more responsible spending, but if it doesn't, they've only themselves to blame. In an article yesterday in the Daily Post Wales, Andrew Gilpin described what motivated him to contribute to the community share scheme. "In the last few months alone we've had unpaid tax bills(of around £200,000), unpaid wages and a £100,000 shortfall in a bond to the Football Conference to let us play at all". "We can't go on like this". In my view, a Supporters Trust is a great way forward, and hopefully it will bring some sanity back into football, but only if more clubs go down this route. It will be interesting to see how this all develops. The Racecourse Ground has been bought by the nearby Glyndwr University, and it looks as if the ground will now be called Glyndwr University Racecourse Ground. So the University will run the ground, and the Supporters Trust will run the club. While this major asset will no longer belong to the club, it seems to be an excellent opportunity for committed partnerships. Supporters Trusts have been around for a number of years, and seem to be growing in popularity particularly among non-league clubs (there are currently 3 league clubs, and 14 non league clubs run by Supporters Trusts). But why can't clubs higher up the food chain also benefit from being run by Trusts? This of course is a pipe dream, for those supporters will only be content with 'success', and the money that goes along with this. If you're part of a Supporters Trust running a club, you will have to be patient, and review what you mean by being successful. This is so much healthier, and takes us back to what grass roots is all about. At the moment there are just over 1,500 members of Wrexham Supporters Trust; they will need more of course, but being the only professional league football club in North Wales means that there is a fair catchment area to call upon. Also, following today's win, the club are third in the league - perhaps this season is going to be a good one after all. The video's not great quality, but I enjoyed seeing it. Wrexham 1 - FC Porto 0.